This book, composed of three short essays and a list of titles by author, looks at the books produced during WWII (and immediately afterward) as small paperback editions. These book titles were picked for their value in entertaining and educating GIs overseas. The titles include Robert Benchley stories, Zane Gray westerns to Selected Stories of Mark Twain. 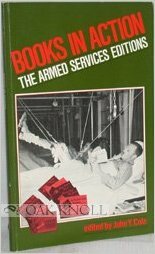 In many cases, soldiers claimed that these books provided them the first opportunity to really get to know good literature. This book is a slim volume but if you are interested in this topic it is the best place to start.